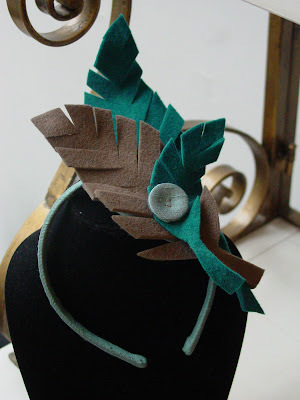 I first found the designs of Masato on Twitter where I had my first glimpse of his terrific designs. 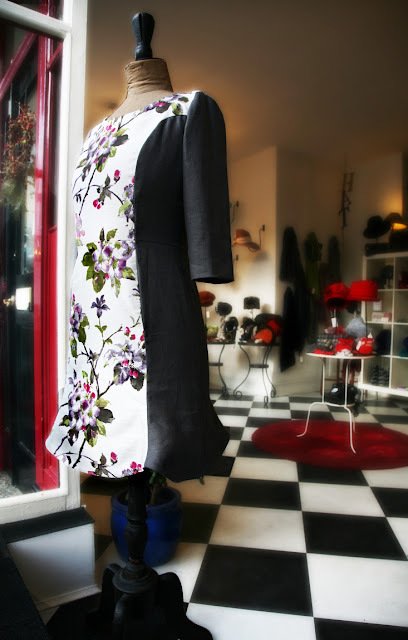 Since then I have been following the Japanese designer on line until a few weeks ago when I was able to meet him while he was in Yorkshire with his partner Mike. 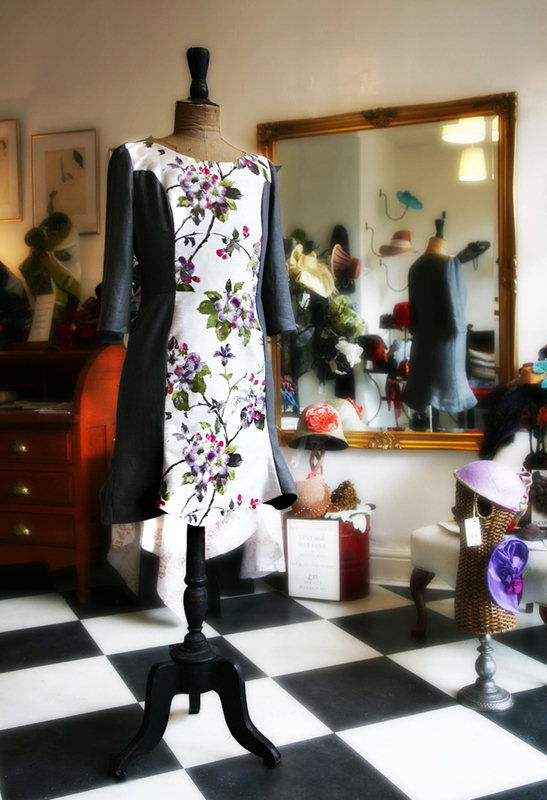 Between us we decided that as Masato will be at Manchester Fashion Week in April next year it would be great for me to have the dress in my shop and spread the Masato word in the north of England. 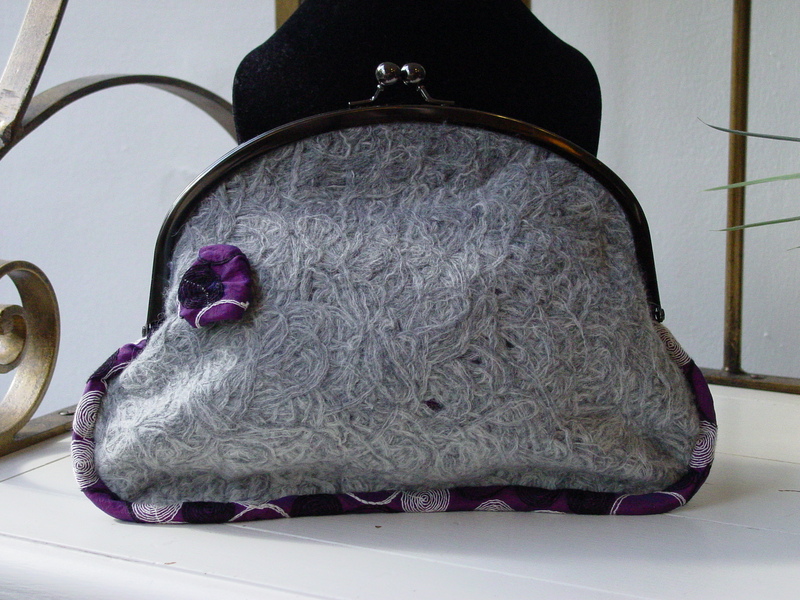 It is hand made and as beautiful inside as out and I have taken a close up of the floral fabric which is silk. 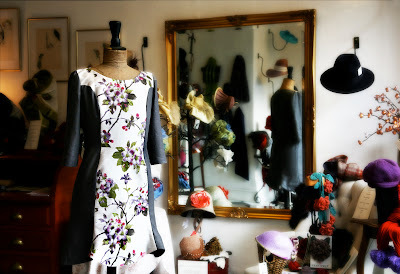 These gorgeous photos (first 3) have been take by Ed Chadwick who runs Snug Gallery here in Hebden Bridge and is my shop neighbour. 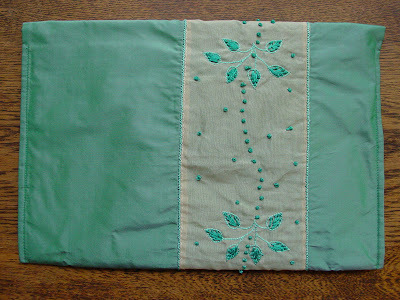 So that just leaves me to wish everyone a very Merry Christmas and a big thank you for following my blog. 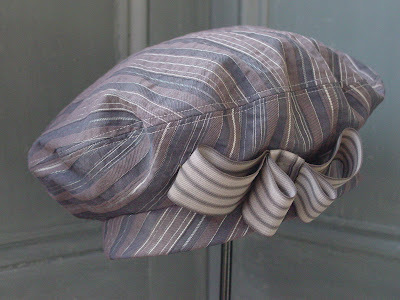 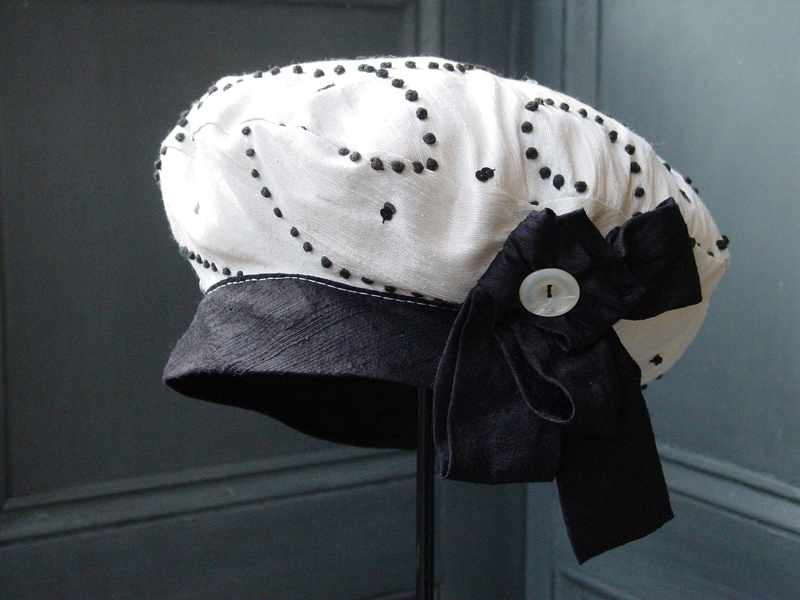 I'll be back in the new year with new designs my beret shop and no doubt other news. 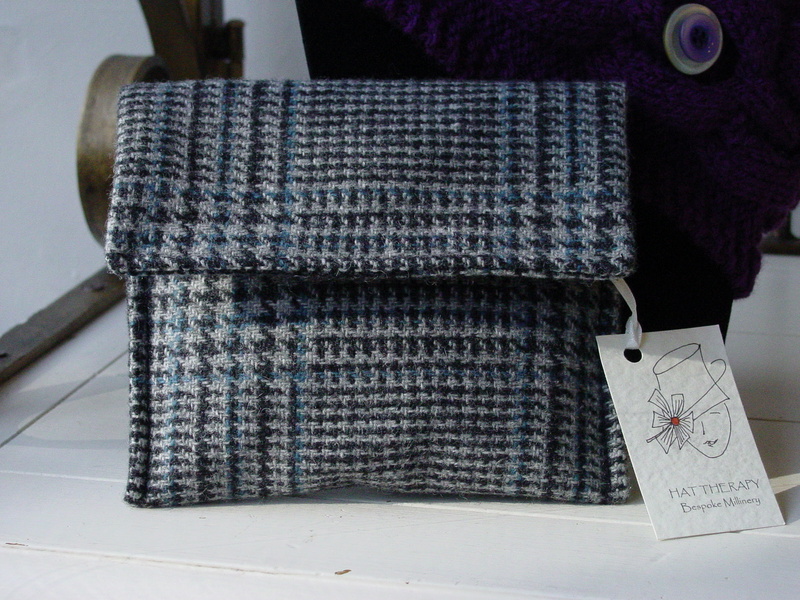 I couldn't resist buying this small piece of wool tweed even though there was only enough for this clutch bag and a couple of other items. 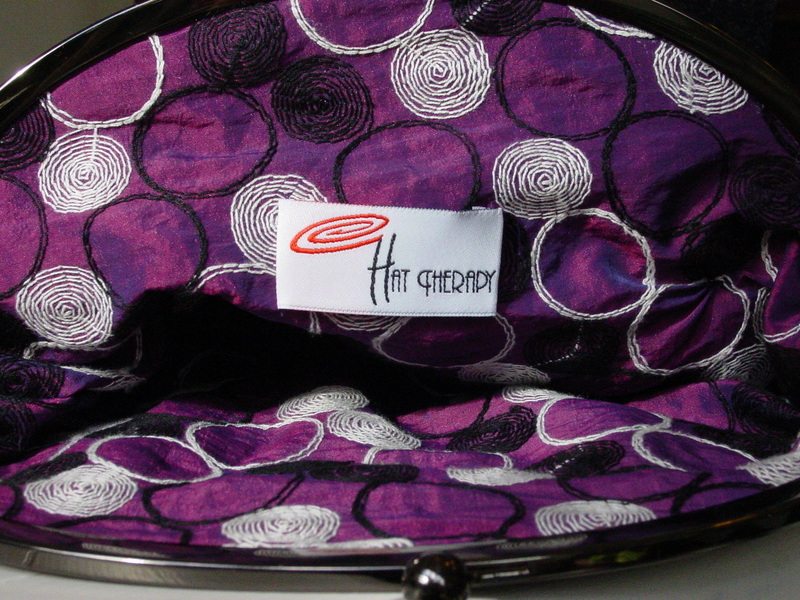 The colours are just beautiful, the little change purse or card holder is an added extra surprise inside. 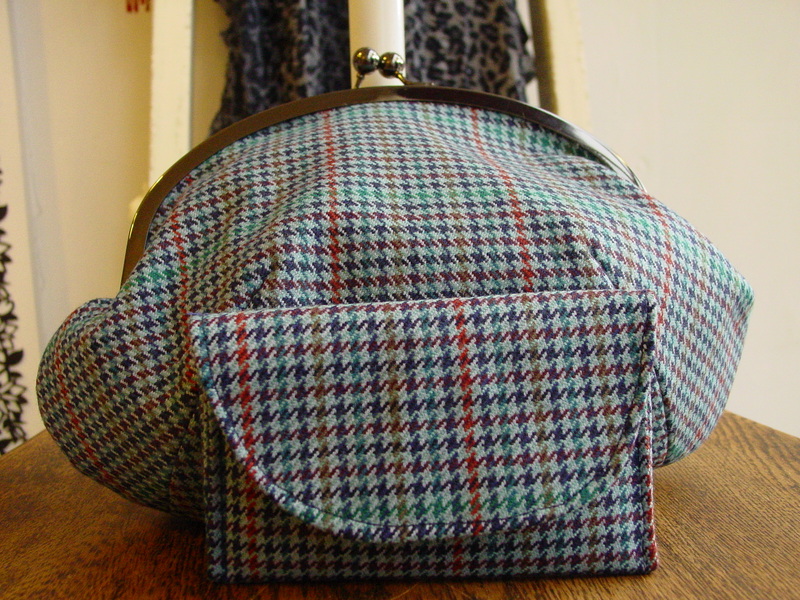 It's just been put out for sale in the shop, I wonder who might find it under their Christmas tree.? 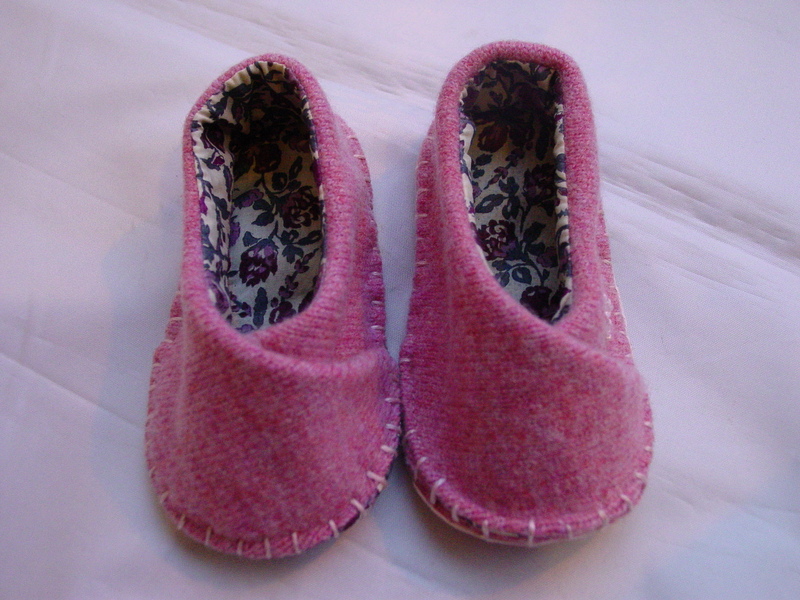 There seems to be quite a few little people in my life at the moment so I have made a couple of pairs of lambswool slippers. 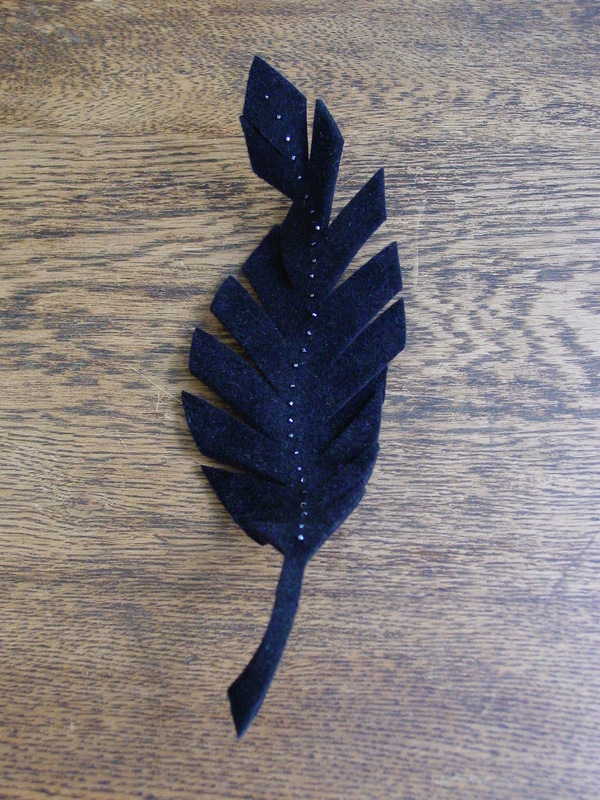 I think I bought the pattern from Etsy quite some time ago but this is the first time I have used it. 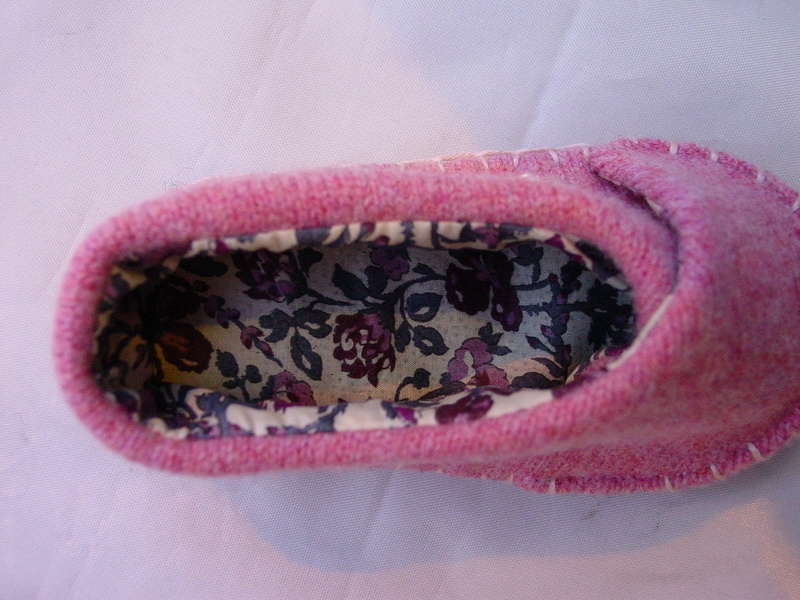 Pink lambswool is lined with liberty print tana lawn cotton and I have edged them with blanket stitch. 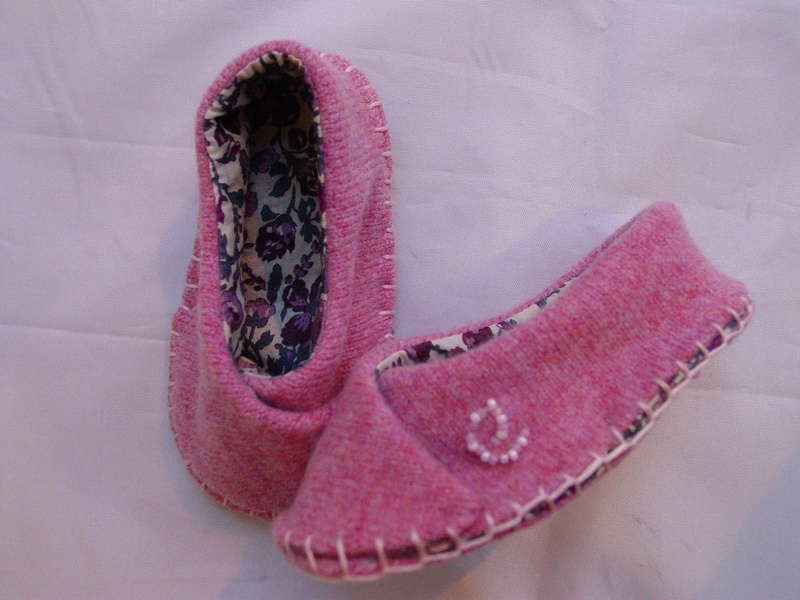 The pink beads are her initial Eloise. The other pair are in deep blue and have gone to the Netherlands for baby Noam. 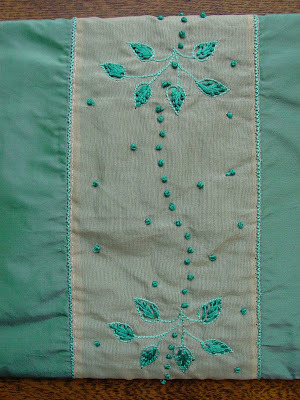 Sometimes a very simple design looks so good just because the fabric is so beautiful. 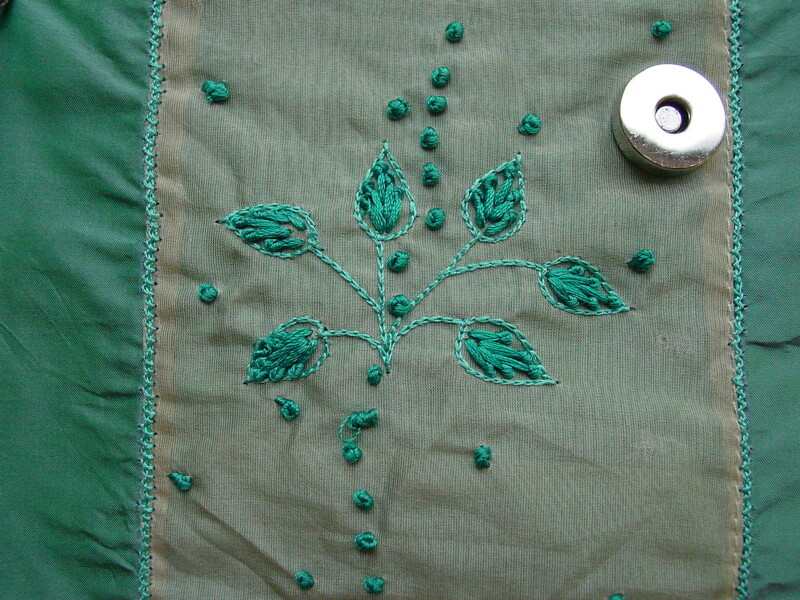 This simple clutch is just that, made from embroidered silk with french knots. 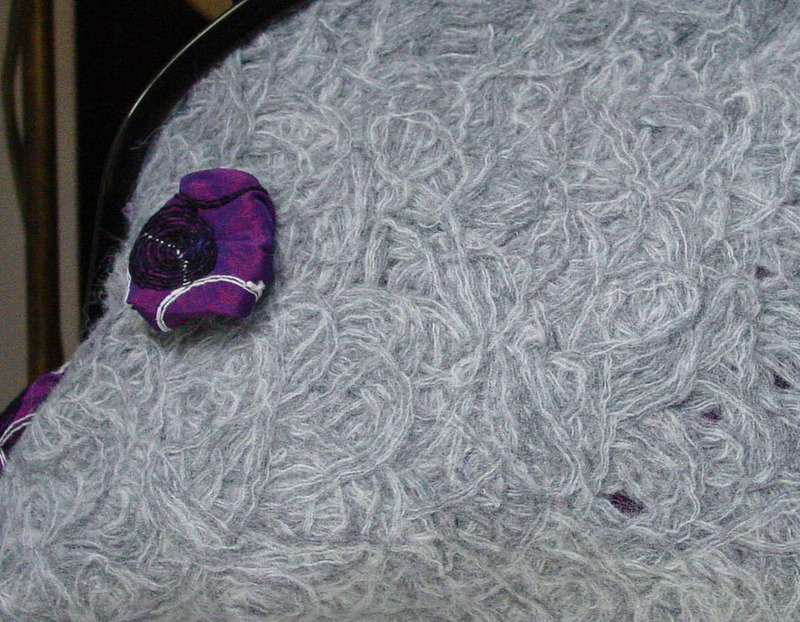 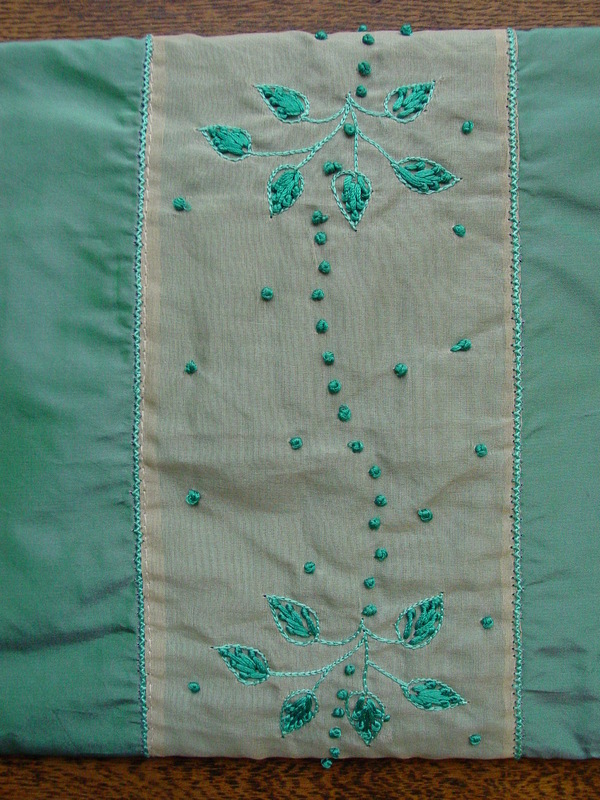 I have lined it in smooth dupion silk too. 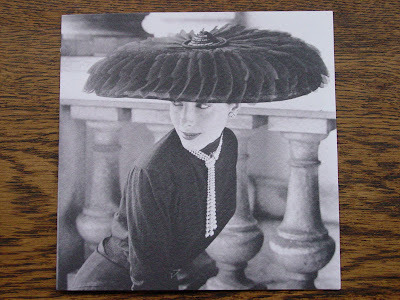 Yesterday was my birthday and a lovely lady sent me this gorgeous card. 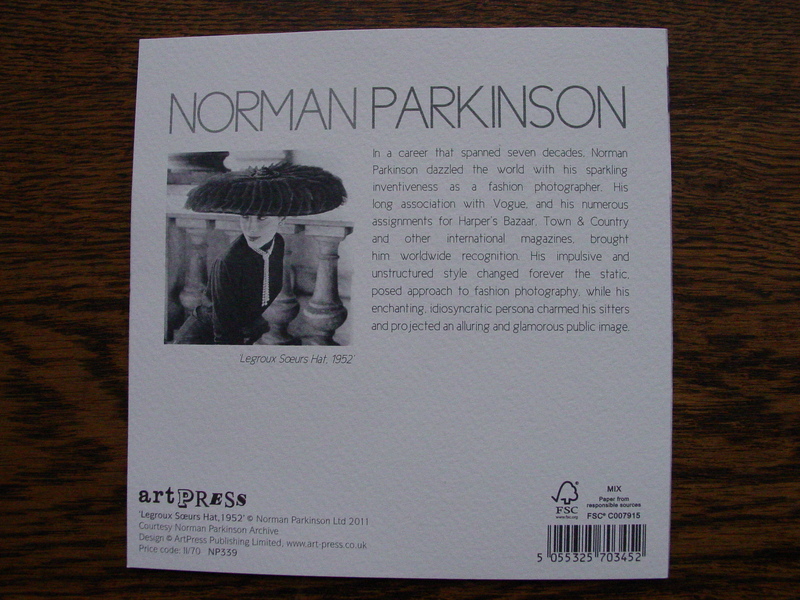 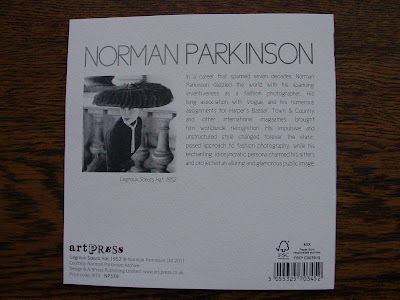 As you can see it's from art PRESS who do sell great cards.I just love it. 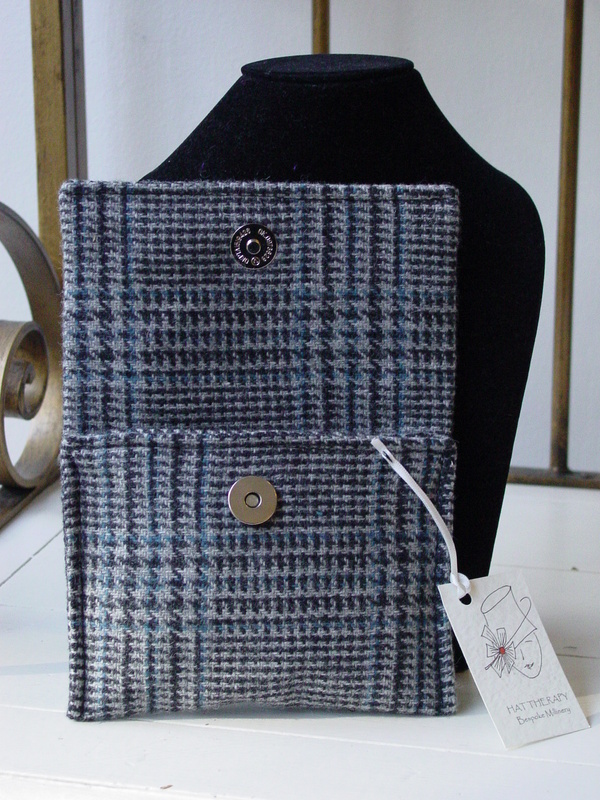 Wool is great to work with I love lambswool especially for bags and small accessories and here are a few that I have made one which has a knitted panel at the front. Plus lovely hand knitted wrist warmers in alpaca, mohair and wool with button and flower trims. I will be celebrating my 6th year here in the shop and on Dec 3rd will be holding my Christmas Fair with Snug gallery next door and Radiance lighting a few doors down the road. 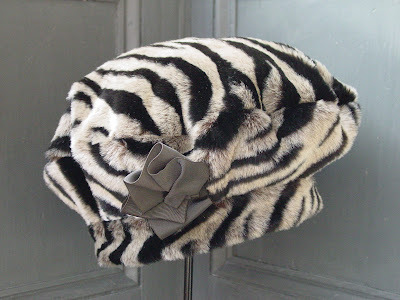 So I am making lots of hats and other goodies just perfect for that hand made present that someone will just love. I am working on lots of berets at the moment as I am opening an online shop. 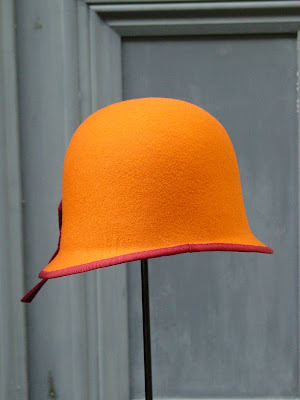 There will be three collections of berets, some to wear for work, some for the weekend and some for anytime you like. I'll keep you posted when it's ready to go. I'm trying different backgrounds for my pictures at the moment . I think the darker one works the best. Theres nothing like a wool hat to keep you warm and with added ear flaps this hat will do just that. 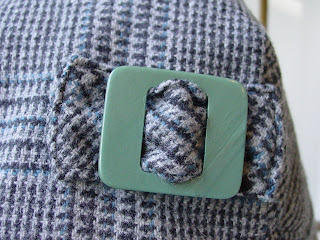 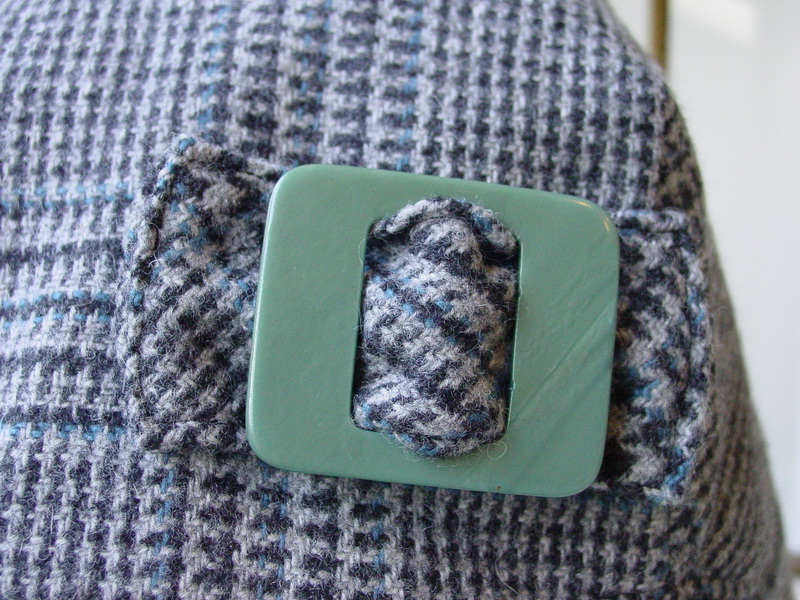 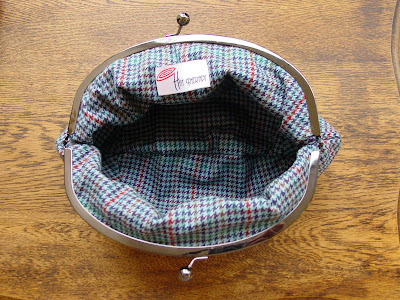 It has a vintage buckle at the front and fits into the nape of your neck keeping it nice and snug. 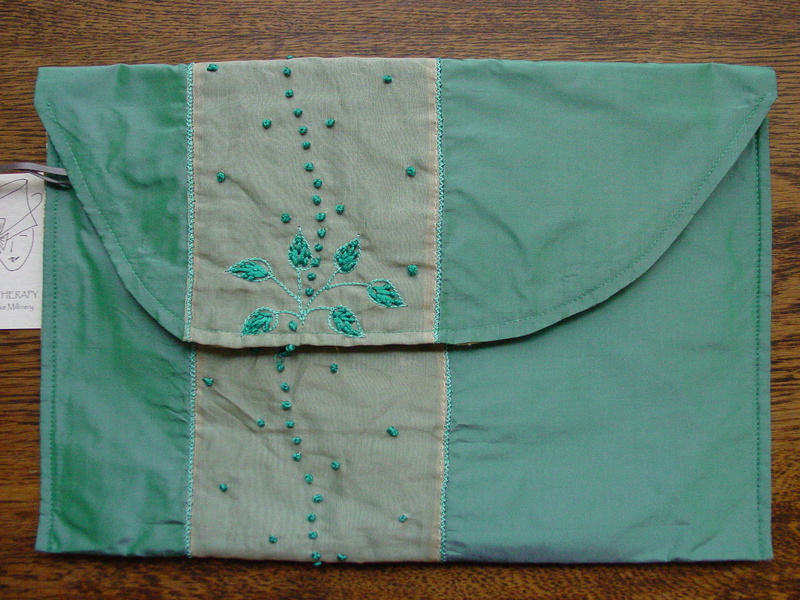 I drafted the patern using a single piece that is cut on the fold of the fabric, and as there was only a small piece left over I made a wallet/purse to match. 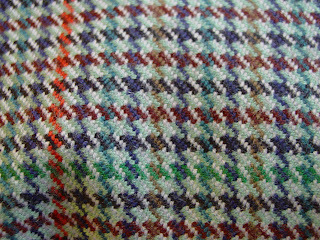 Not everyone's cup of tea in shape but it's a good job we all like something different. It's great to have a bag that can take all the things you need but not weigh you down. 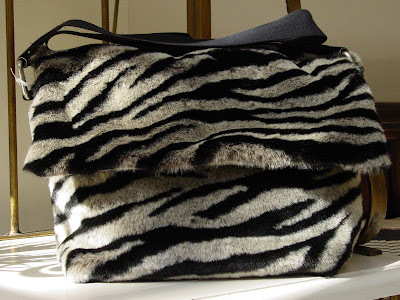 This vibrant zebra print in fake fur is so soft and light, weighs very little, has loads of space and with a sturdy webbing strap and hard base can hold a lap top or i pad plus all your extras.The silk lining gives it a touch of luxury and adds to the overall look. 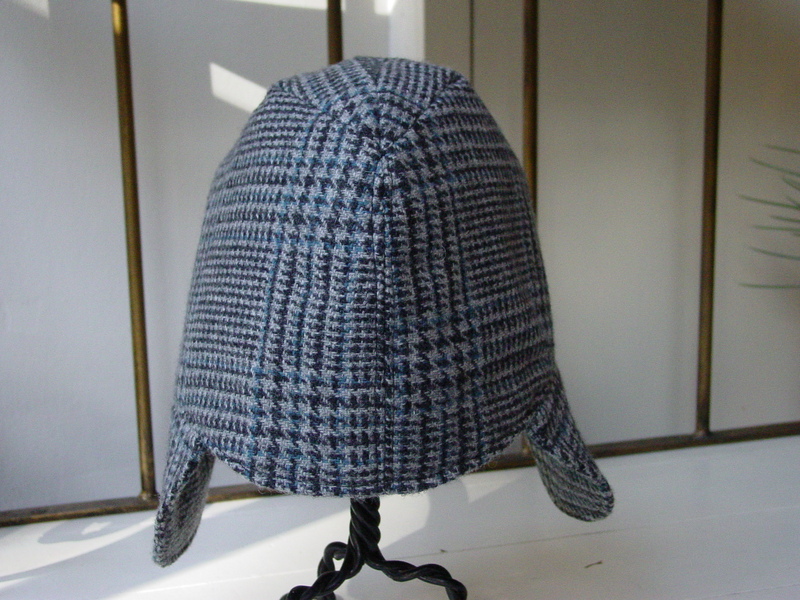 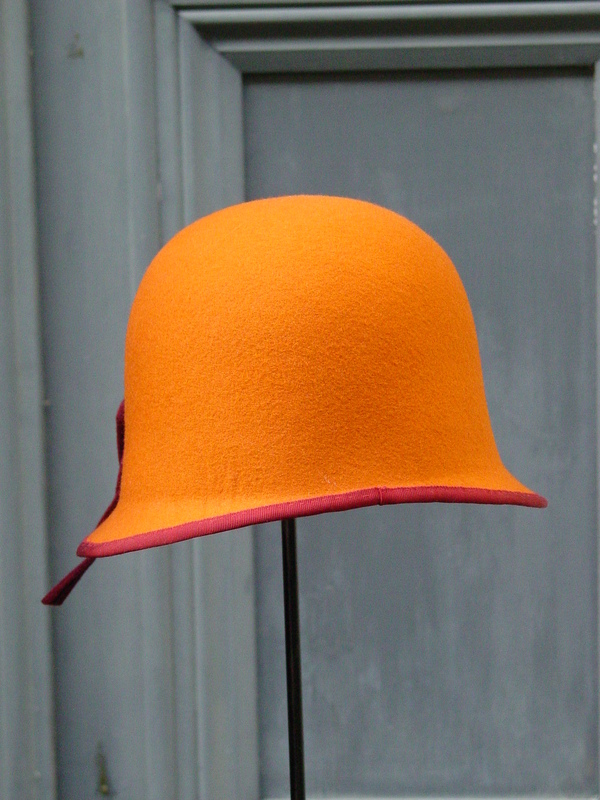 There's also a beret or Russian style hat to match in the same material if you feel the cold. 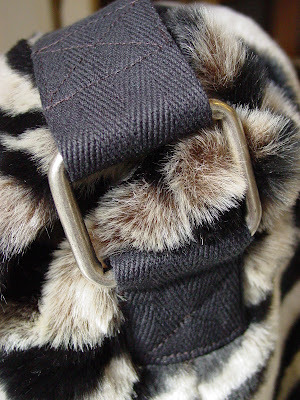 This is the very best fake fur I have ever found, so I am very happy I was able to buy it in a few other designs which include a leopard print. 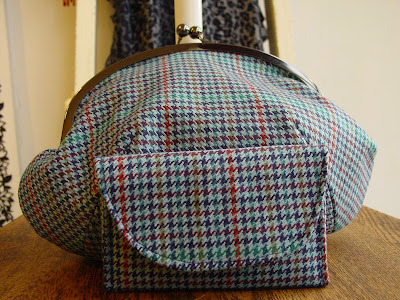 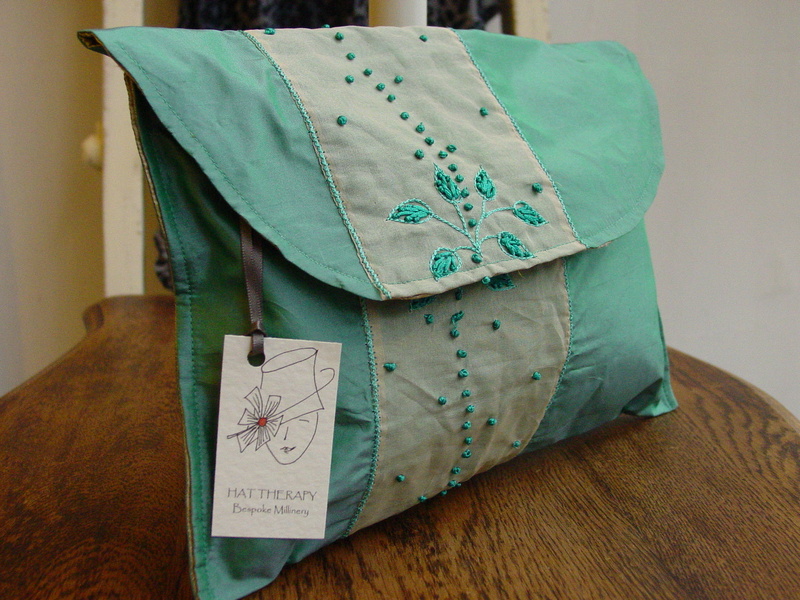 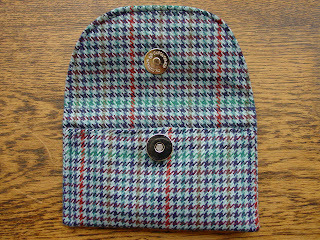 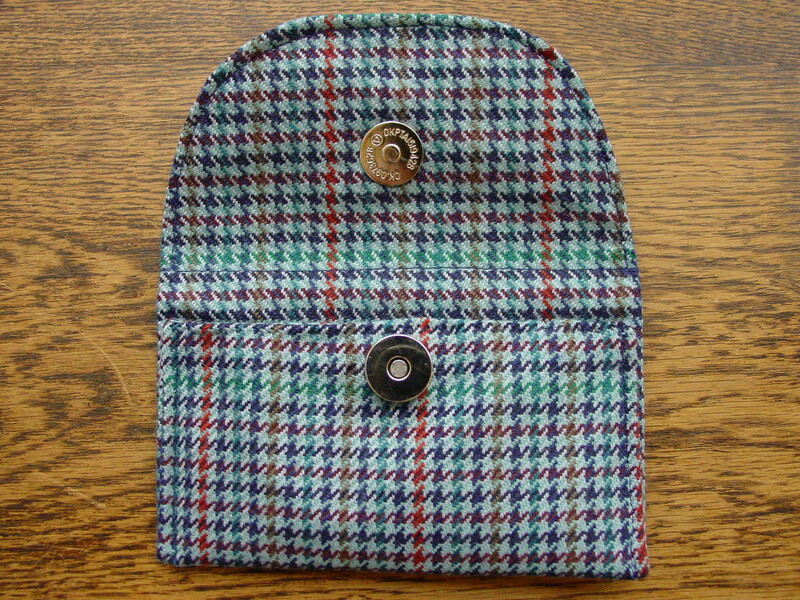 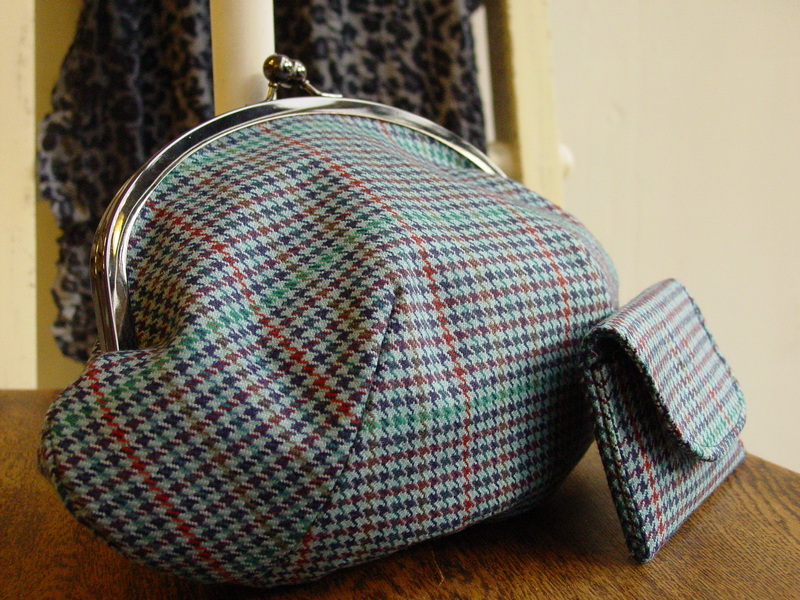 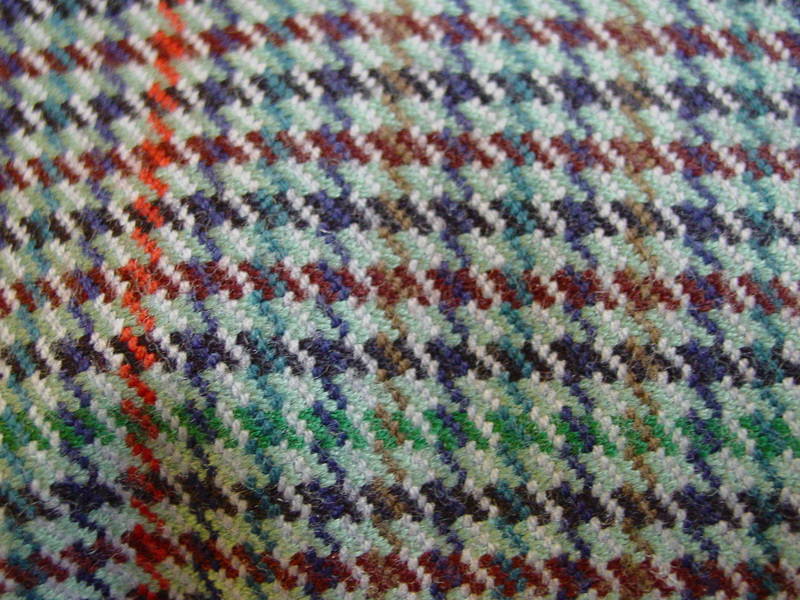 As well as all the hat making here at Hat Therapy there are always fabrics that I decide to make in to a bag. 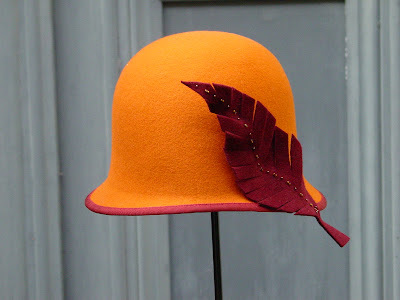 Very often there is a hat to go with it but not this time. This clutch bag has been made from some very unusual felted wool, I took a close up of the fabric to try and show the details, it fades from light to dark from top to bottom. 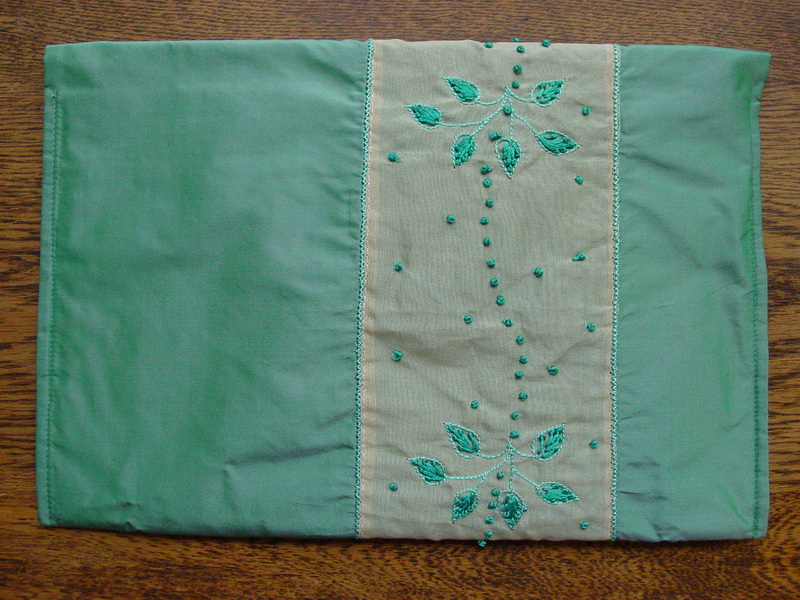 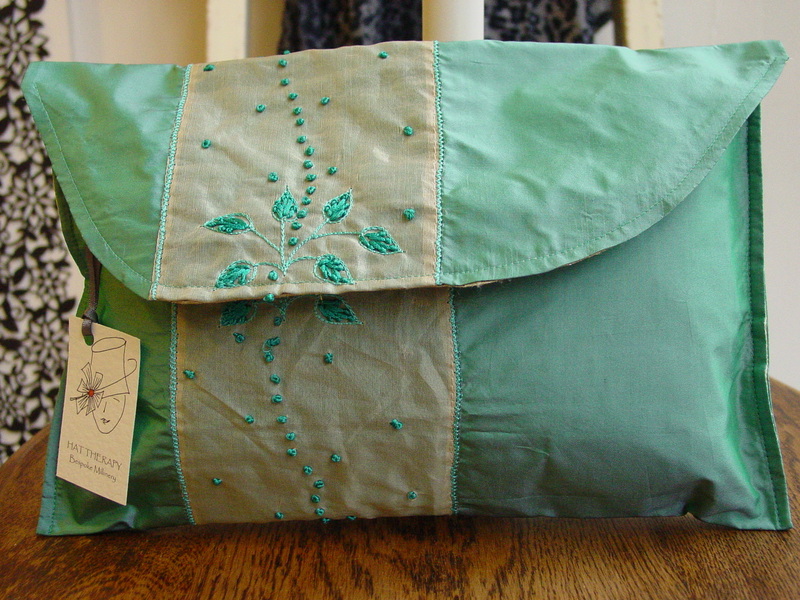 Inside I have lined it with a lovely embroidered silk and added a small trim on the front in the same fabric. 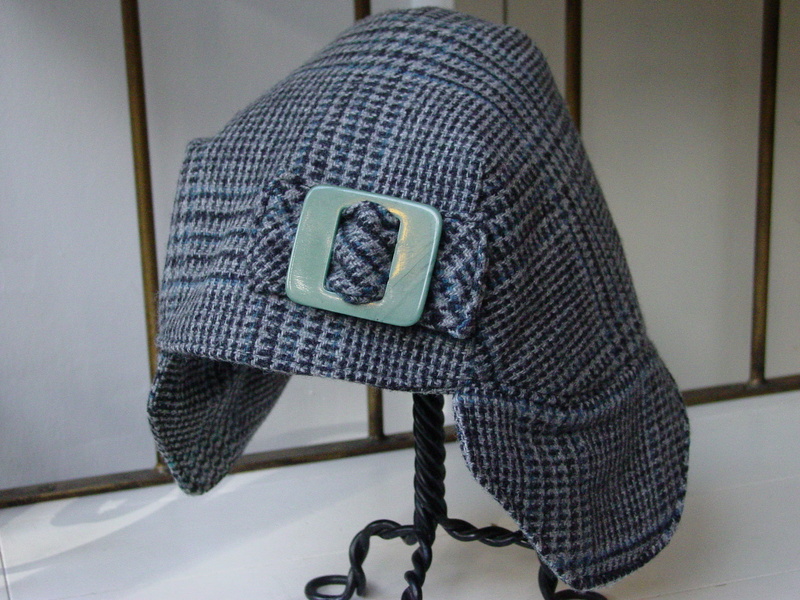 The metal frame is a gun metal grey and is just the right tone to show off the felt. 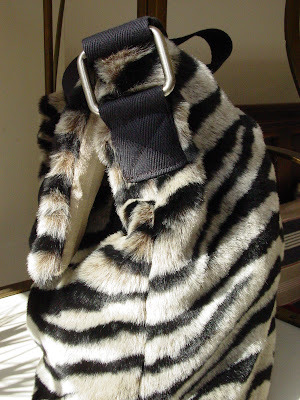 We all wish winter wouldn't come around so soon but there is always the plus of winter dressing. 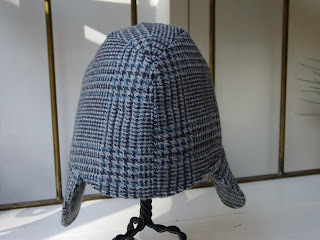 Hats always come in handy when it's cold especially if you have to wait for a bus or train on your way to and from work. 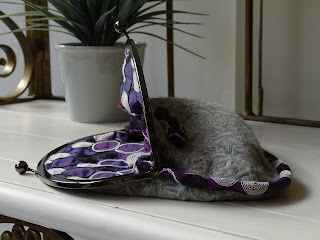 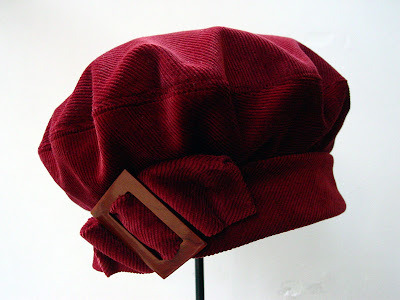 I am busy making lots of winter hats, like the felt cloche above and the simple cord beret with a vintage buckle and as it's time for pulling out your warmer coat, why not add a great looking hat. 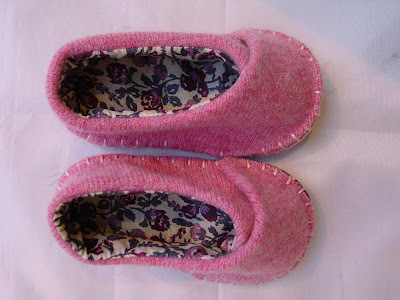 Here in the u.k. we have been promised a week of warmer weather but you can never tell till you wake up. 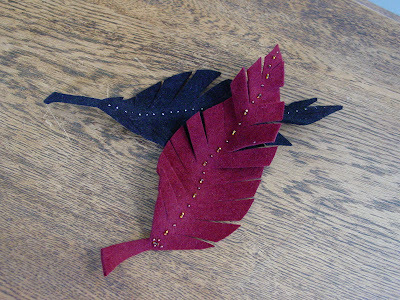 I made some felt feathers many months ago, but only used them for a few trims. 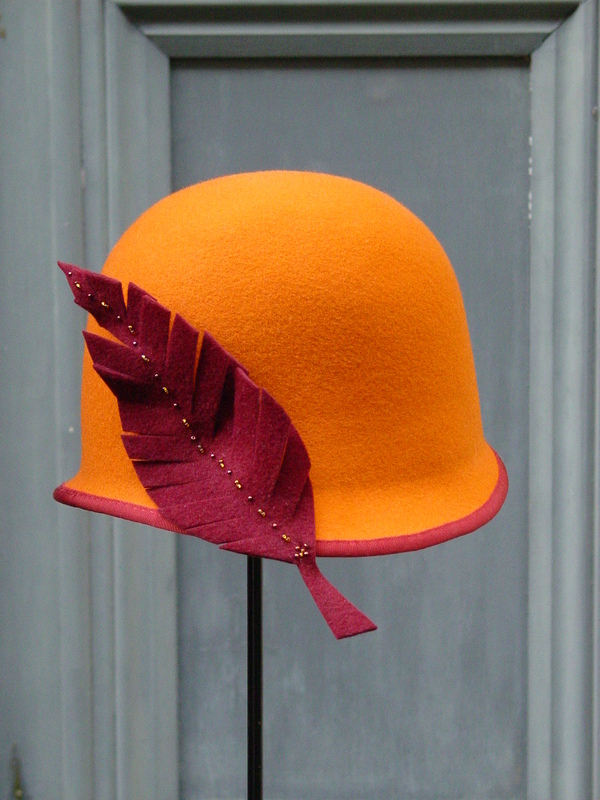 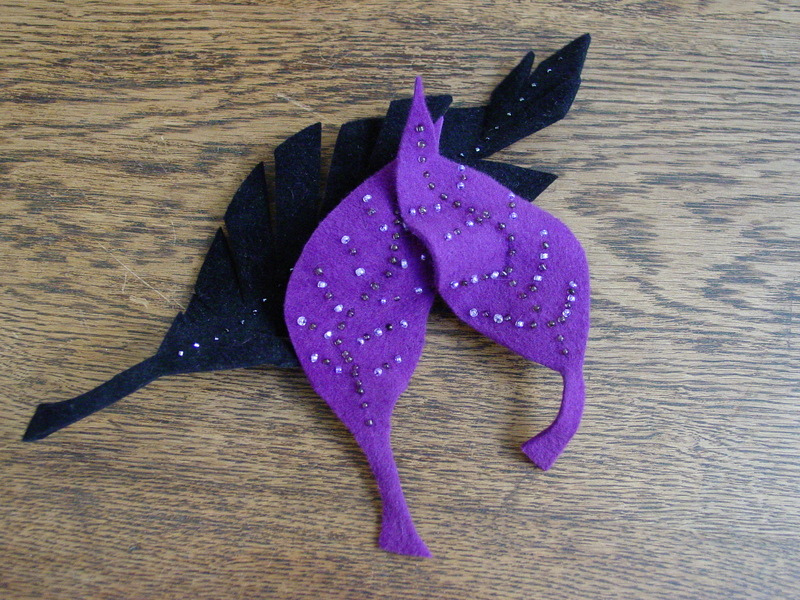 However in the week I needed to make something in felt for a lady to wear with a trouser suit and anything too fancy looked wrong, she liked the idea of feathers but they were too light and had decided she would like to have something made in felt. 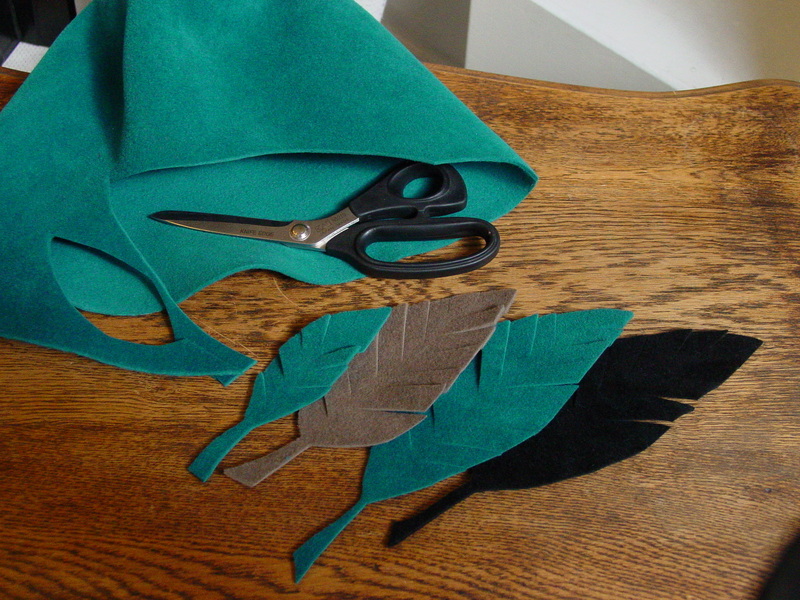 Hey presto felt feathers came to the rescue. I used two colours to tie in with her outfit and covered a headband in silk.I did have to sew a fine wire on the reverse side in order that I could twist the felt into a feather like shape. The result was very striking. Here's a few pictures of some I have made since then, I added small beads to two and also made a couple of leaves.